The past couple of months have seen an increased acknowledgement of the role social media has to play in the development of the financial services sector. Industry forums like Finextra’s Live Social Media Days held in London and New York and the inaugural LinkedIn Financial Services Summit in New York are capturing the zeitgeist of financial social media. If you’d prefer a digest, here are a few best practice rules to follow along the way. To see how this is playing out in reality, here’s a look at how retail and investment banks are using social media and see how they are adapting themselves to cope with the challenges of social media within their legislative framework. In the US, the Securities and Exchange Commission (SEC) and Financial Industry Regulatory Authority (FINRA) want advisers participating in social media sites to keep and store detailed records of their communications (up to five years for advisers participating in social media sites, with three years in a readily available format), and content posted on social media to be vetted by regulators and internal compliance departments. Firms must also be careful about distinguishing what constitutes a recommendation and what constitutes research. In the UK, the 2010 FSA guidelines on ‘new media’ assume that the main use of social media will be as another marketing channel, rather than a medium of consumer or peer interaction, and guidance as yet is not so clear. An update from the regulator’s Mortgage Market Review said in 2011 that it was “perfectly possible” for mortgage advice to be offered via social media sites, texts and instant messaging on mobile phones, adding the proviso only that firms who offer advice on mortgage deals by text and live web chat must still assess whether the mortgage is appropriate for the customer. The Goldman Sachs Group, Inc., the most powerful investment bank on Wall Street, is going to be the brand to watch over the coming months. Admittedly, it’s been a tough year so far for the group, following the crisis caused by a ‘rogue’ employee Greg Smith, whose resignation letter in The New York Times decried his firm’s “toxic culture,” and alleged that senior Goldman bankers had disparaged clients. The viral spread of Gerg’s letter lead to the losses of $2 billion worth of market value as company’s shares fell 3.4 in trading over the course of the day after Greg’s announcement. CEO Lloyd Blankfein (who, incidentally, has an $16.2 million annual salary) hit the business news for the first time after two years’ silence with a confession: “Obviously it’s occurred to us that we haven’t gotten anything, er, everything right with respect to how we, how we’ve dealt with the public”. Goldman Sachs CEO’s announcement was followed by immediate changes within the organisation: a new Head of PR, Jake Siewert, who started his work with an announcement of the new vacancy – Social Media Strategist. In a job posting on the company website, the bank said the ideal candidate will be responsible for “monitoring online conversations and participating in those conversations to build brand visibility and thought leadership.” Poisoned chalice or career-making challenge? Goldman Sachs, who only started tweeting on their official Twitter account – @GoldmanSachs – on 24th May 2012, is taking the first step in entering the social media arena. Will Siewart’s efforts and those of the new ‘Social Media Strategist’ succeed in turning the beleaguered giant’s reputation around? Watch this space. 2011 has been a challenging year, trying to find the best solutions and the software to ensure compliance with the regulations. Morgan Stanley has opted for Socialware. Socialware sells software that can archive messages, house a library of prewritten content and allow compliance officers to oversee postings. Fay DeBellis’ tweet wasn’t an impromptu thought from an investor. It was a prewritten post, taken from a library of 140-character messages that had been approved by the compliance department of Morgan Stanley and sent out by financial advisers at Morgan Stanley Smith Barney. Ms DeBellis assessed that LinkedIn alone has bought her about $10 million worth of business over 18 months. In June 2011, MSSB also launched Advisor Insights, claiming it to be the first internal social networking site for such financial advisers. Working like an internal version of LinkedIn, financial advisers with experience in a specific area post their profiles, follow peers, and pair up with other advisers within the company who need their expertise. J.P. Morgan Retirement Plan Service – a subsidiary of J.P Morgan Chase & Co – launched a social media forum called ‘Voice of the Community’ in 2011. Billed as an “interactive virtual experience for J.P. Morgan plan sponsor clients”, the invitation-only website will be an online resource for plan sponsors to interact with others, share experiences, and exchange product feedback. The Voice of the Community will offer resources in the form of case studies and white papers, information and guidance on new products and services. The J.P. Morgan Chase Corporate Challenge (now in it’s 36th year of being) last year ran a successful global social media campaign primarily on Facebook, engaging communities all over the major global cities. This social media strategy is built on the excitement of the offline event – a race organised in the various cities across the globe. Designed to raise money for charity and promote ‘fitness in the worksplace’, the new social media element of the race increased brand awareness and built up online communities to share in the excitement before, during and after the event. 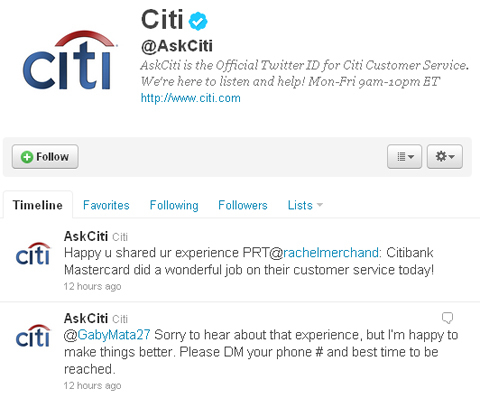 CitiBank One of the largest consumer banks in the USA is actively using Twitter to resolve customer complaints. Frank Eliason (who was behind @Comcastcares) joined the organisation in August 2010, and set about revolutionising the way the bank talked to its customers via Twitter, YouTube and blogs. As was reported in The Wall, the move is part of a plan to target young, wealthy customers in urban areas and create a customer experience appropriate to them. Investing in technology is also a wise move for a retail bank that has relatively few branches and needs to sign more people up online. In late 2011, Aviva – the world’s sixth largest insurance group and a UK savings and pensions provider – implemented a social media campaign across Facebook, Youtube and other social media sites, aiming at encouraging younger workers to save for the future. Social media was chosen as the most effective and efficient way of connecting and building the relationship with younger audiences while also educating them about finance, sharing ideas and provoking conversations. Aviva chose this way to engage a group traditionally hard to interest in savings and pensions: they created informational, entertaining content which drove traffic to their Facebook page. UK bank HSBC- an The Social Element client – have been proving the worth of social media both on Facebook with their Advance and Student pages, and on Twitter. HSBC Advance is a pilot by the global banking team to test whether its customers wanted to communicate via Facebook. They do. In just under one year, HSBC Advance has over 76,000 fans and handles all kinds of customer services issues. The HSBC Student Bursary competition hosted on Facebook, now in its fourth year, attracted 363 video entries in 2011 and the competition page received more than 38,000 ‘likes’. HSBC’s social media team also drew praise recently for a demonstration of how social media can assist in a crisis, their Twitter account keeping customers updated during a technical failure which resulted in a cash machine outage. Update: Just heard about Swedbank, the the leading bank in Sweden, Estonia, Latvia and Lithuania, which has opened a virtual branch on social networking website Draugiem.lv. This makes it the first virtual bank branch on a social networking site in Europe. At this branch, any registered user of Draugiem.lv will have “fast, convenient and safe access to online advice about their finances from Swedbank’s experts”. Many thanks to Neria Kundrotaite, CEO Strategy and Business Development at Lex van Dam Trading Academy, for her assistance in writing this article.